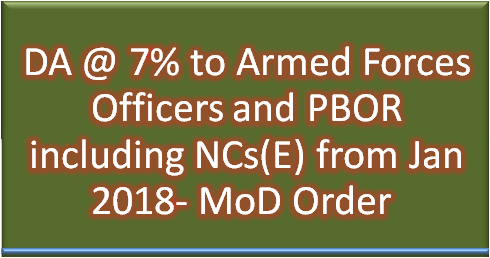 Subject: Payment of Dearness Allowance to Armed Forces Officers and Personnel Below Officer Rank including NCs(E) - Revised rates effective from 1st January, 2018. I am directed to refer to this Ministry's letter No. 1 (2)/2004/ D (Pay/Services) dated 3rd October 2017, on the subject cited above and to say that the President is pleased to decide that the Dearness Allowance payable to Armed Forces Officers and Personnel Below Officer Rank, including Non-Combatants (Enrolled), shall be enhanced from the existing rate of 5% to 7% of the basic pay with effect from 1st January, 2018. 3. The Dearness Allowance will continue to be a distinct element of remuneration and will not be treated as pay within the ambit of Pay rules of Defence Force Personnel. 5. The payment of arrears of Dearness Allowance shall not be made before the date of disbursement of salary of March, 2018. 6. This letter issues with the concurrence of Finance Division of this Ministry vide their Dy. No. 79-PA dated 26.03.18 based on Ministry of Finance (Department of Expenditure) O.M. No. 1/1/2018-E.II (B), dated 15th March, 2018. Dearness Allowance payable to Armed Forces Officers and Personnel Below Officer Rank, including Non-Combatants (Enrolled), shall be enhanced from the existing rate of 5% to 7% of the basic pay with effect from 1st January, 2018.